I needed something to hold my new Dyan Dylusions paints and round blending tools. I've been watching Dyan's Youtube videos giving tips and techniques for using her new paints and got an idea for storage. I looked around my creative space and found boxes! Many of us have them, saving them for something special. They were right next to my scraps of paper, empty paper towel rolls and gelli prints. :o) In Dyan's videos, I liked the tray she has her paints in. I found a box in my stash, cut it to size and covered with decorative tape. I wanted a separate storage for my blending tools - a solution that held them with the foam-up and separated. I had a box that was the right height. I trimmed the sides so it would easily fit through my eBosser cutting machine to make the holes with Die'sire Essentials Dies - Circles. I marked the placement by dipping the bottom blending tool in ink and "stamping" the box. I then cut the holes. During my decorating process, I put the round pieces back and tapped them from the bottom with a low-tack tape. 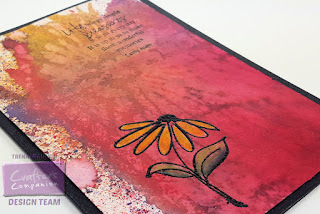 I used my Gelli Plates, a variety of StencilGirl stencils and the paints to decorate. All of the designs I made started the same way - I dabbed gesso through the stencil on one piece of cardstock, flipped the stencil over and rubbed on a second piece of cardstock. Basically, I get the positive and the negative. The examples below were over gelli print designs. To see more on the method and supplies I use for gelli printing, and also for making my own design paper, click here. After the gesso dried, I pulled out all my pencils and just colored and colored, and colored. All these designs will be made into greeting cards at some point, but I just couldn't wait to share! This one I did over plain black cardstock. I used another stencil in the set that had the lovely swirls. This one was over a gelli print. This one I did over textured cardstock and added additional gesso with my finger. I cannot decide how, or if, I want to add the color. I really dig the simplicity and texture. 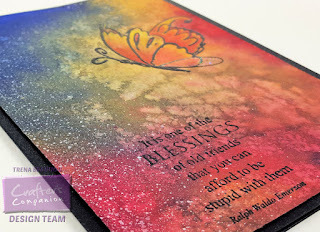 You can visit the StencilGirl blog to see more designs with this month's release, as well as many beautiful designs with their other stencils. I no longer hesitate to buy "plain" since I got my Gelli Plate! I used to spend time looking for the right color or design and being disappointed when something only came in one color - a color that did not fit my style. Recently, I went looking for a business card portfolio that was just the size for my purse. Not that I would use it for business cards, as I keep my contacts in my smart-phone. I saw an organization tip on Youtube - rather than try to squeeze your credit cards, library cards, membership cards, etc... into those three little slots in a wallet, use a business card portfolio and you can quickly flip through to find the card you need. I had looked on line and in various local stores. I finally found the one I wanted and the only color they had was black. No worries, I knew I would add my own colors and customize it for me. I got out my Gelli Plate, acrylic paints and stencils! I used all StencilGirl designs for the portfolio. NOTE: I cleaned it first by wiping it down with a little alcohol on a paper towel. I really dig how the design turned out on the textured portfolio. Of course, I could not stop there. :) I pulled out some paper and went to town. I used more StencilGirl, some artistcellar, and my new Patti Parrish stencils from iStencil. What a good time I had! I was recently inspired by Patti Parrish. I learn a lot from Patti and enjoy watching her videos/Ustream sessions. Click here to see what inspired my design. Next, I added color with a variety of paints, drying in between layers with a heat tool. Added (1) black and white strips of paper (printed out from my computer. I just opened up a document and added lines) and strips of a gelli print I previously made, (2) stamping using images from Cornish Heritage Farms and Crafter's Companion, with VersaFine ink pads & LUXE ink pads. I also used a small dauber and plastic with the LUXE ink pads to add some design elements. The focal image is from the Kanji collection. I heat embossed it with gold emboss powder and then edged the circle with a gold metallic ink marker. On the inside I added the small piece of the design paper that I had trimmed. It was a lot of fun going through the creative process - hanging in there and building more color through the 'ugly' stages. :o) There's so many possibilities! So many different ways to color and add design elements! I'm going do it again. I hope you'll try too!